Showcase Custom Vinyl Windows and Doors manufactures high-quality vinyl windows and doors. A vinyl window is a window that has a frame made of PolyVinyl Chloride Resin (PVC), a strong plastic compound. Showcase has chosen vinyl as our primary product due to its strength, durability, insulating properties and low maintenance. Traditionally, windows of wood or aluminum have been a popular choice. As more research is conducted on the matters of energy efficiency and heat loss, a need has arisen for a higher performing window. Increasingly, vinyl window frames have stepped into the breach as the logical answer. Vinyl has the property of a natural insulator. That is to say, there is little-to-no energy loss through the frame or sash of the window. While wood may exhibit this property at first, over time the wood can warp, crack, and mold. This lessens the integrity of the frame, allowing air infiltration and the lose of insulating capacity. Aluminum is a very poor insulator because of its ability to conduct energy through its metal frame. Energy loss is inevitable and noticeable with an aluminum window. Eventually, a wood window frame might absorb the moisture around it. This has been known to cause the frame to warp, crack, develop mold, attract bugs, and can draw in airborne carcinogens. This can be prevented by a constant struggle to refinish and maintain the wood windows. However, this is a costly and time-consuming battle involving washing, painting, staining, and weather-proofing the frame. Aluminum windows get pitted over time or develop corrosion in the form of white rust. They, too, will ultimately require labor-intensive care in the form of refinishing or repainting. Contrary to those windows made of wood or aluminum, the vinyl window is virtually maintenance free. The frame will not warp, crack, split, mold, or attract bugs because it is a sturdy plastic compound. The color is built into the compound so it will not fade or require repainting. Vinyl windows do not absorb any of the pollution or moisture that is in the air, which is extremely important in the humid Gulf Coast region. No work is needed to maintain the performance and beauty of the vinyl window. A simple wash every now and then to remove dirt from the window is all that is needed for it to look and perform as new. 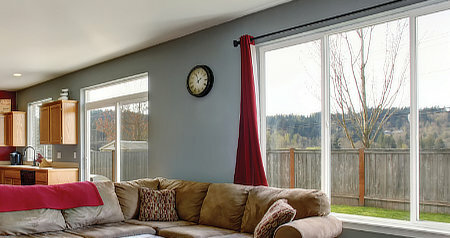 Purchasing a Showcase custom vinyl window or door provides energy efficiency for your home. A lower energy usage not only provides you with financial benefits but also lessens our impact on our natural resources. All things being equal, vinyl framed windows provide the greatest number of advantages. Their manufacturing process is inherently less detrimental to the environment. They require zero maintenance. They are the most efficient of any of the options available. Lastly, they strike the most reasonable compromise on the price vs. value scale. Most companies tend to mass produce stock sized windows. This can lead to wasted material and is therefore not energy efficient. At Showcase Custom Vinyl Windows and Doors, our products are custom built for each and every order. Therefore, there is no potential for any wasted material. Be smart for our earth, your family, and your wallet with Showcase Custom Vinyl Windows and Doors.